The second-largest country in South America, Argentina has a rich history and abundant natural treasures, including mountain ranges and grassy plains, or pampas, where gauchos (cowhands) herd cattle. A network of estancias, or ranches, covers most of the country. We’ll visit and stay in several estancias on this 14-day, active foodie trip, which immerses us in Argentina’s culinary delights—many that fuse European and indigenous flavors. Our departures are timed to coincide with two exciting festivals: grape harvest (in March) and the Gaucho Festival (in November). We explore the urban sizzle of Buenos Aires, the pastoral beauty of the winemaking Mendoza region, and the wild northwest, which is strongly influenced by its Spanish colonial and indigenous heritage. Argentina is a world-class producer of lemons, apples, pears, cheese, and—of course!—wine. As our tour guide and “gastrosopher,” Alejandro Frango, says, “Argentina offers more than beef, tango, and Evita.” Join us in experiencing some of Argentina’s unforgettable flavors. Exploring this vibrant city on foot gives us on-the-ground insights into the lives of the Porteños, as Buenos Aires inhabitants are called. We’ll browse food and cattle markets, stroll on cobblestone lanes in beautiful barrios, watch traditional tango dancers, visit the grave of legendary Eva “Evita” Perón and peruse the Evita Museum, and dine in fantastic restaurants where we’ll taste local specialties and Argentinian wines. We’ll even cruise the Paraná Delta in the Tigre municipality. Ninety minutes from bustling Buenos Aires is the traditional town of San Antonio de Areco, Argentina’s gaucho (cowboy) capital, famous for its elaborate, silver belt buckles and horse tack. We’ll spend two nights at a historic estancia, an Argentine cattle ranch, where we’ll hike through the pampa grasslands, observe ranching techniques, possibly go horseback riding, rub shoulders with the gauchos, and enjoy their music and dances. During our November departure, we’ll also attend the Gaucho Festival. 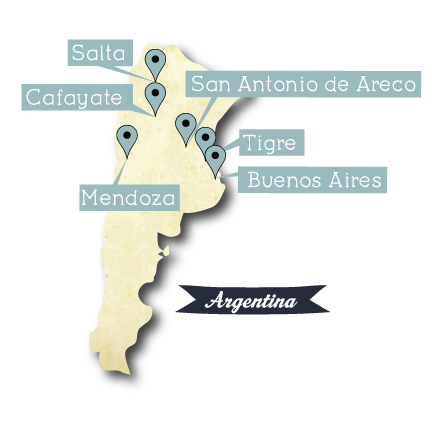 We’ll fly from Buenos Aires to western Argentina’s Mendoza province, the capitol of Argentina’s winemaking industry. Here, the arid, Mediterranean-like terrain is planted with vineyards and bordered by majestic mountains, where we’ll hike. The Mendoza region produces world-famous Malbec—a robust red wine—and we’ll learn about wine production and taste the fruit of the vines at several artisanal and organic wineries. We’ll have our own asado feast, a traditional barbecue during which Argentines linger with family and friends over a meal that includes multiple courses and plenty of wine. Another day, we cycle from winery to winery (tasting as we go!) on quiet country roads in the scenic Uco Valley. During our March departure, we’ll help pick grapes during the Harvest Festival. Next, we fly from Mendoza to Salta province, where we take a road trip through the heart of Argentina’s northwestern wine country where the specialty is Torrontés, a fruity but dry white wine. Along our route, we’ll drive and hike through stunning landscapes of colorful cliffs, scenic gorges, and the Calchaquí Valley, where we’ll stop to view ponchos and pottery in remote Indian villages and keep our eyes open for condors and guanacos (similar to llamas). Highlights include wine tastings at several vineyards and a tour and meal at Colomé, one of Argentina’s oldest and highest-altitude wineries and home to a James Turrell art collection. In the pretty town of Cachi, we’ll have a lesson in preparing empanadas, pastry pockets stuffed with savory meat, cheese, or vegetables. And in the town of Salta, we’ll peek in at the San Miguel Market and visit the Museum of High-Altitude Archaeology, which showcases treasures of the Andean Incas. We’ll depart from the Salta airport. Choose a return flight to Buenos Aires, or extend your trip to Iguazú Falls.